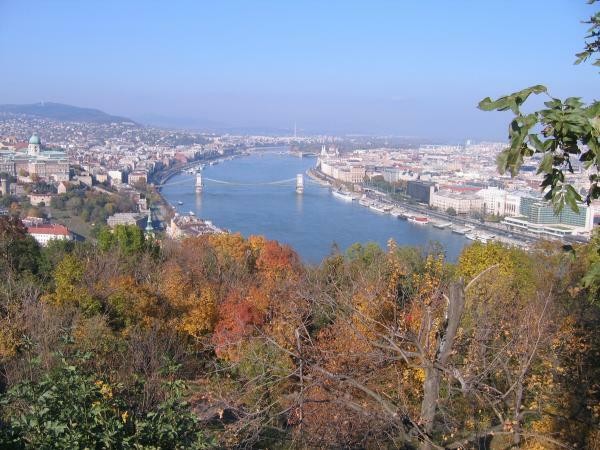 Originally, we were planning to continue on the Hungarian side of the Danube and go through Tata on the way to Esztergom. 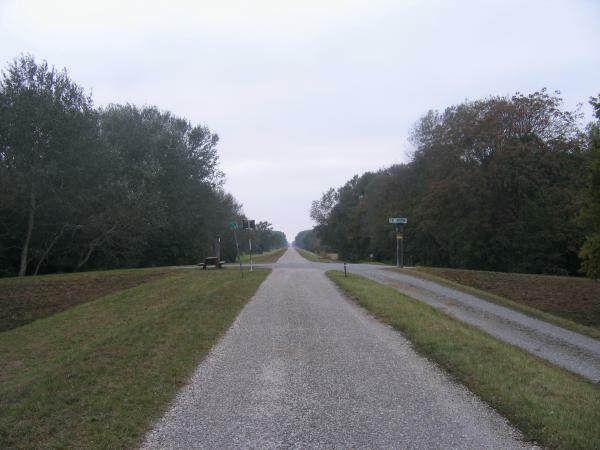 However, after reviewing the bike route, we would have to ride along busy roads for most of the way. 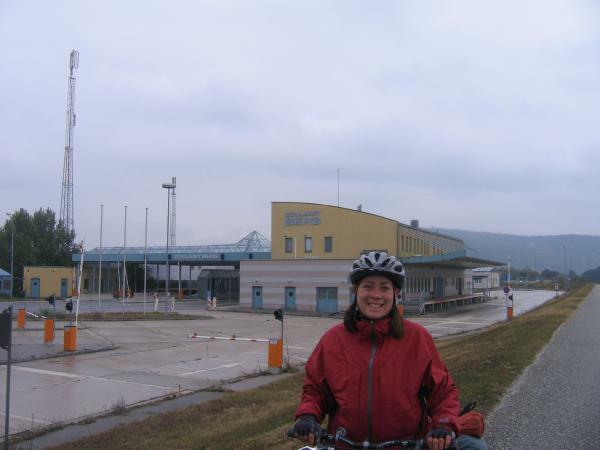 We checked out the bike route on the Slovakian side of the Danube, and the ride seemed much more pleasant with more of the route along bike paths and quieter roads. 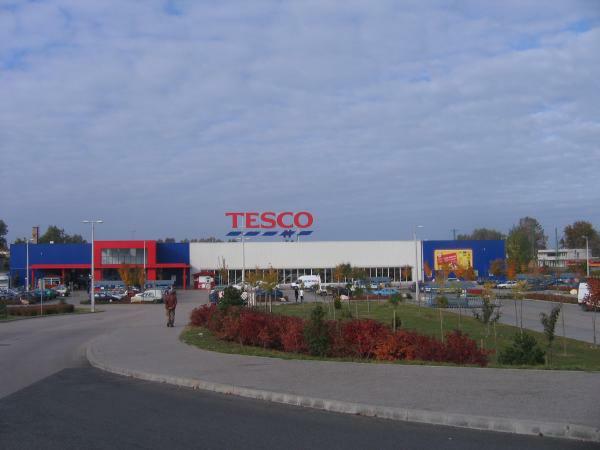 As we were about to cross the Danube to the Slovakian side, we saw an enormous store that looked like a Super Wal-Mart. We stopped to check it out, and it was huge and just like a Super Wal-Mart! We were surprised to such a large store since the other stores we had seen were much smaller, so we thought Europe had escaped from big Wal-Marts shutting down small shops. But, apparently, there were Super Wal-Marts in Europe, too. 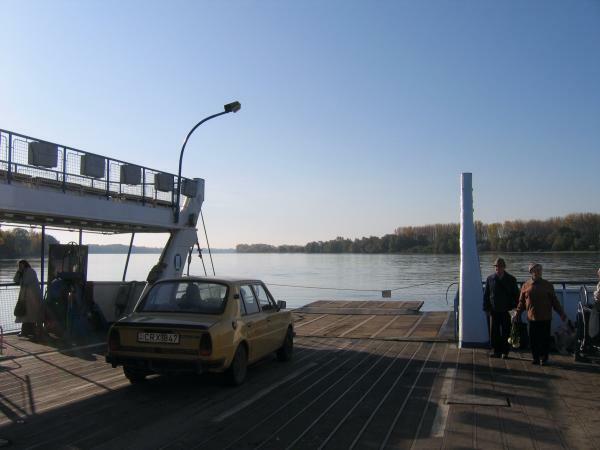 As we crossed the Danube to enter Komarno, Slovakia, there was another border checkpoint that was no longer in use. However, this border checkpoint was not vandalized like the other border checkpoint we passed. 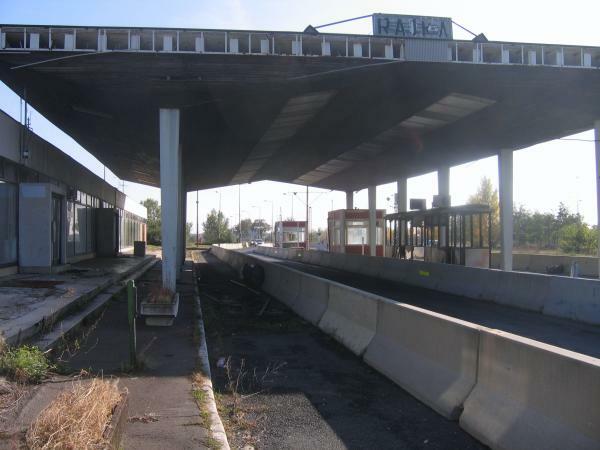 There was a money changing station still open at the border checkpoint, but it will no longer have any function once Hungary switches to the euro. 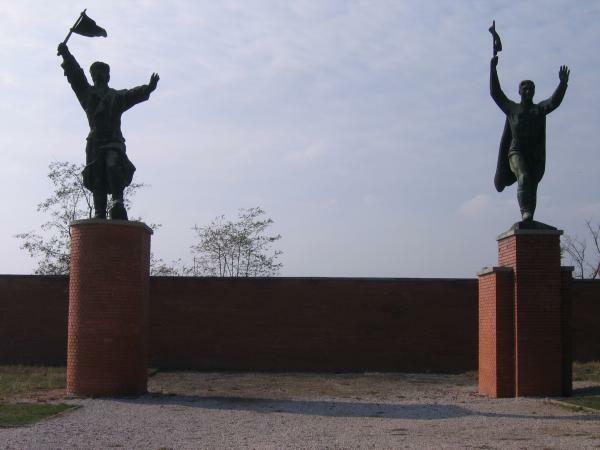 We were impressed how prosperous Komarno was. 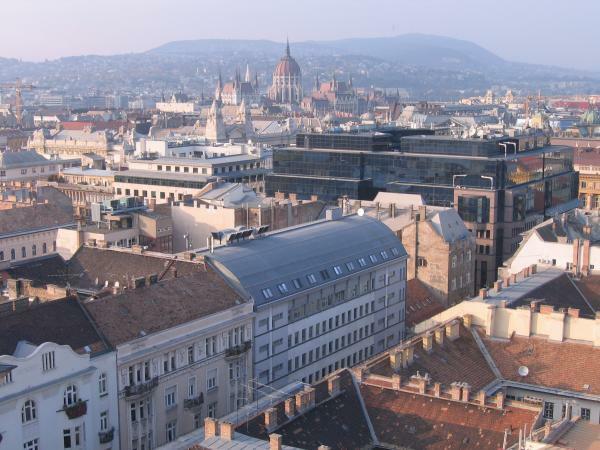 Slovakia’s economy is transforming the fastest in the EU, and it seemed to us that in several years it will look like the other countries in Western Europe. We enjoyed the bike ride today. Most of the ride was on a gravel bike path along a dike by the river. We had to ride along busy roads for a few short stretches, but it wasn’t too bad. As we were riding, we passed these wonderful artistic creations made out of hay bales. 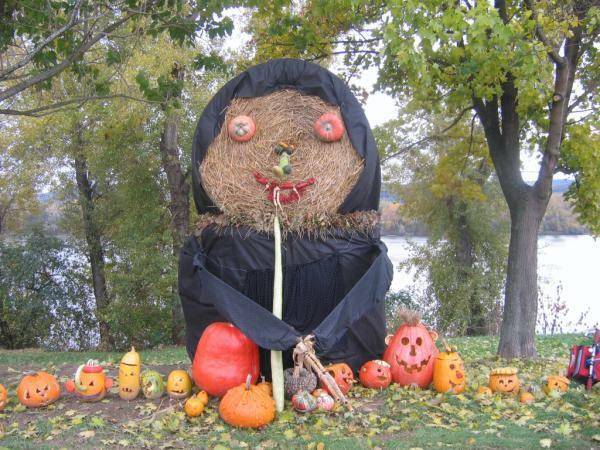 For one of them, they used hay bales to create a witch with a broomstick made out of a cornstalk. 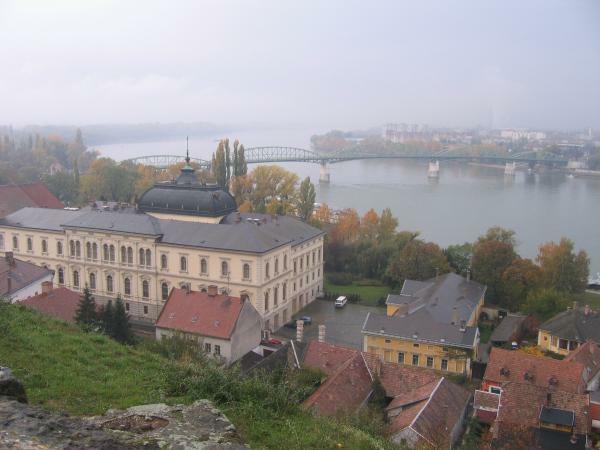 We reached Sturovo, Slovakia and crossed the Danube River to get to Esztergom, Hungary. The Maria Valeria bridge we crossed over the Danube was blown up by retreating German troops in WWII on December 26, 1944. 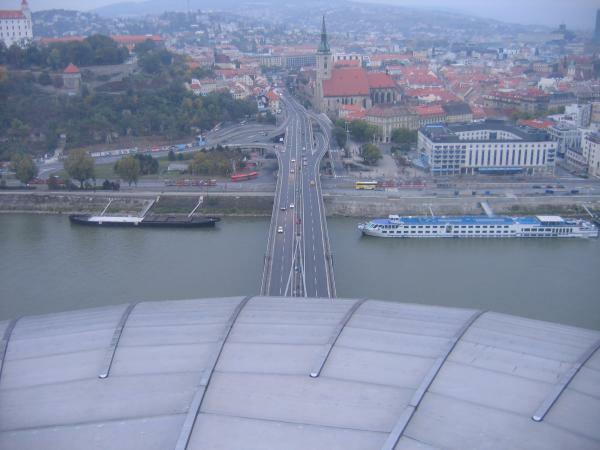 However, due poor relations between Czechoslovakia and Hungary after WWII, the bridge was not reconstructed for over 50 years, and the bridge was not reopened until 2001. 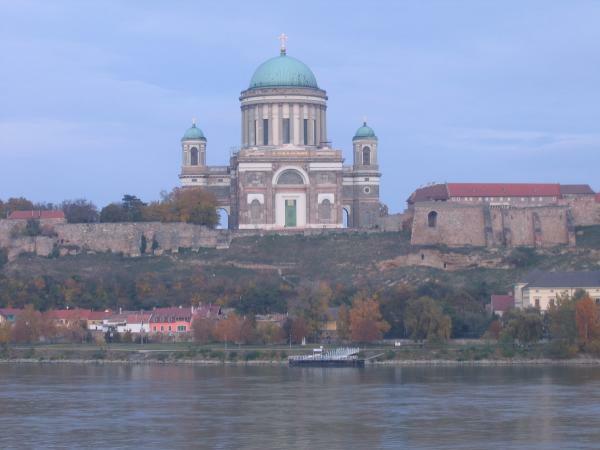 Esztergom was known for its basilica as it was the Roman Catholic church’s capital in Hungary. There is great view of the basilica form the Maria Valeria bridge. 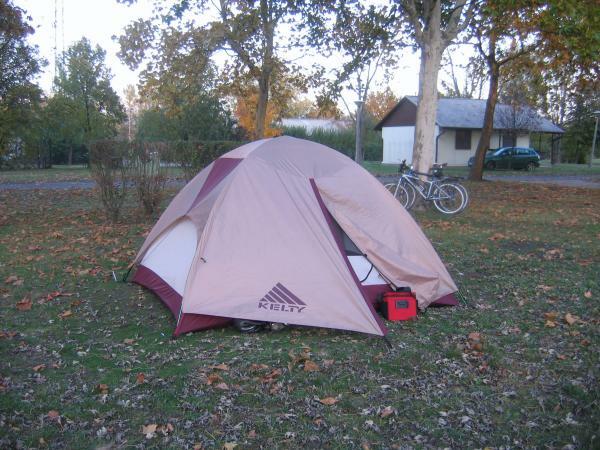 We tried to stay at the campground in Esztergom, but it was closed for the season. After a couple tries, we found a pension for the night. The room was really nice, and they had a computer where we could use the Internet for free! 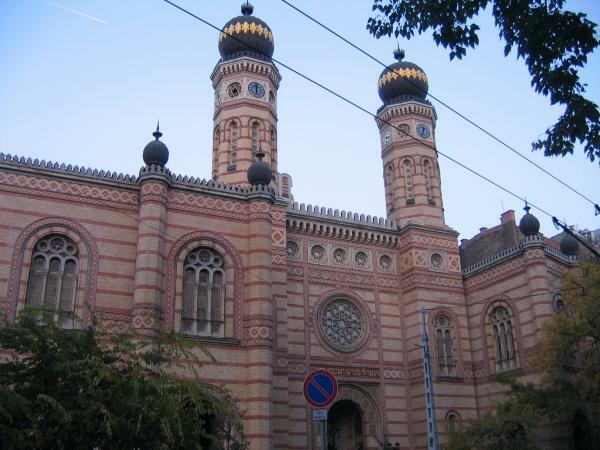 Now that we had reached Esztergom, we were only 70-75km from Budapest! 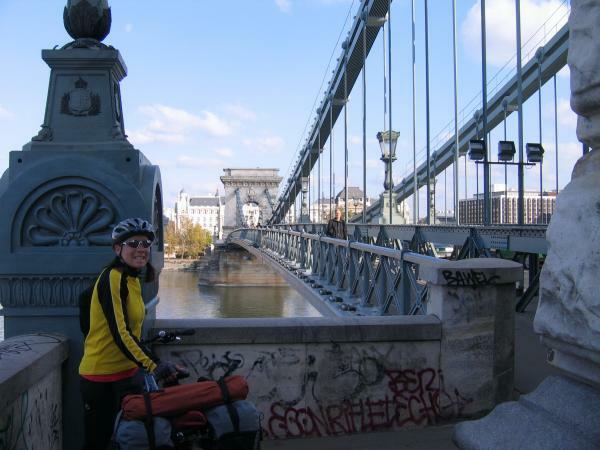 When we first started on our bike tour, Budapest seemed so far away, so it was amazing that we were so close to reaching our final destination. We had a fun day of riding through rural Hungary. The official bike route followed a busy road for part of the way, and it wasn’t much fun riding along it. 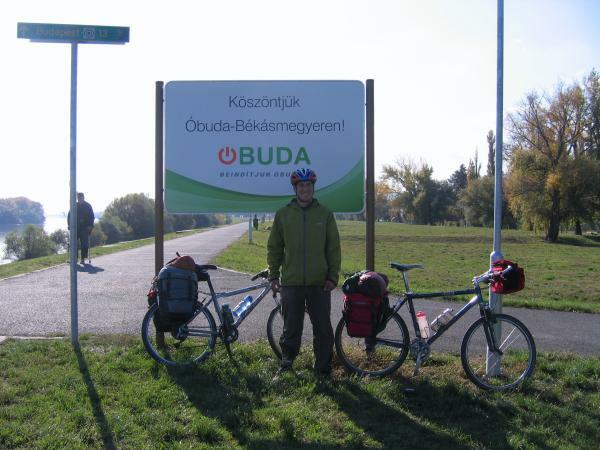 As we were riding along the busy road, we saw a Danube bike route sign that directed us to turn off the main road onto a quieter secondary road. We checked our map, and the bike route sign did not match the route on our map. 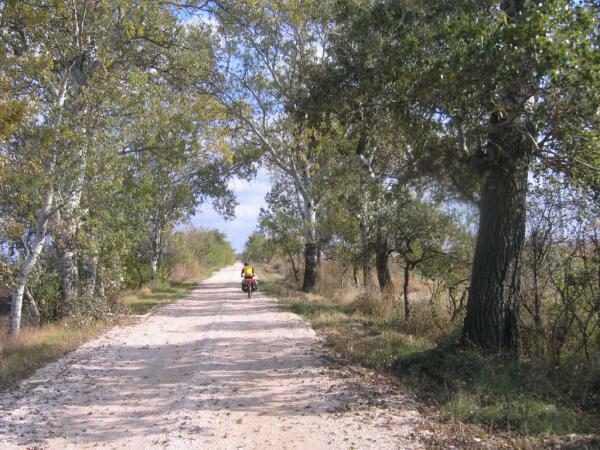 But, we were tired of riding along the busy road, so we decided to try it. That was the last bike route sign we saw, so we had an adventure finding our way back to the official bike route. We rode on dirt roads through tiny farm towns. 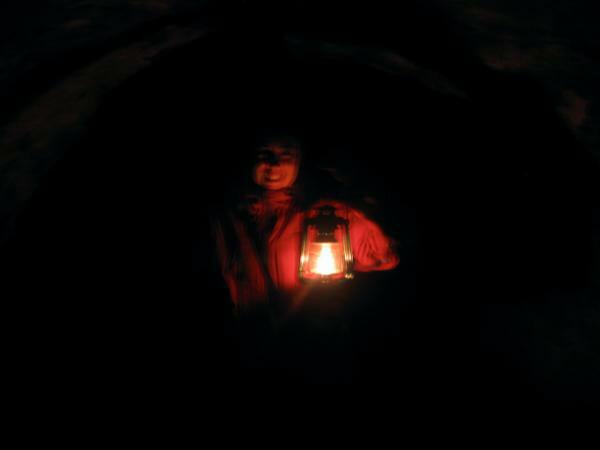 We passed people in the towns, and they stared at us like we were from outer space. It didn’t seem like they got many bike tourists. 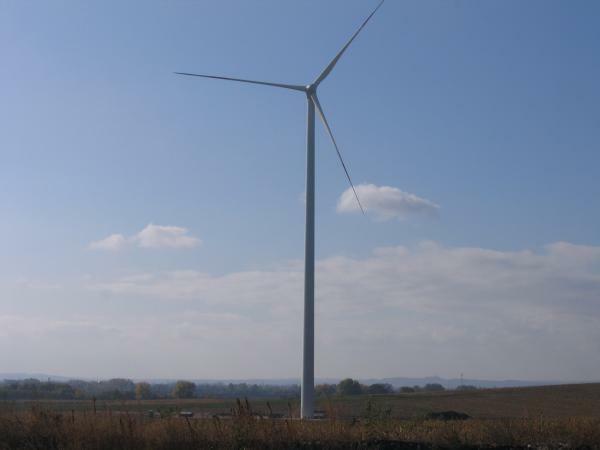 The dirt road was surprisingly well maintained, and we realized the reason was the building of a new wind turbine. 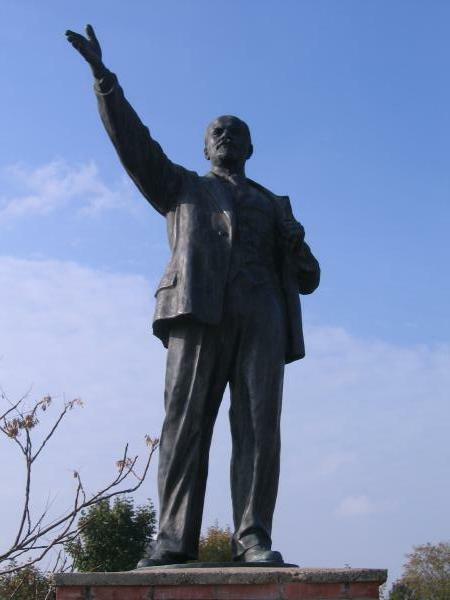 We reached Komarom by 2pm, and it was another 20km along busy roads to reach Tata.We didn’t want to get into the same situation as last night, so we decided to stop for the night in Komarom. We actually found a campground in Tata that was still open for the season! The campground was next to the thermal baths, so we could use the baths as part of our camping fee. We spent a couple hours relaxing at the thermal baths in the evening. The thermal bath complex was huge! There were several rooms with pools with different water temperatures. We spent most of our time in a wonderfully hot outdoor pool. The thermal baths were a popular place, and they were packed with people. Today turned out to be more of an adventure than we expected! 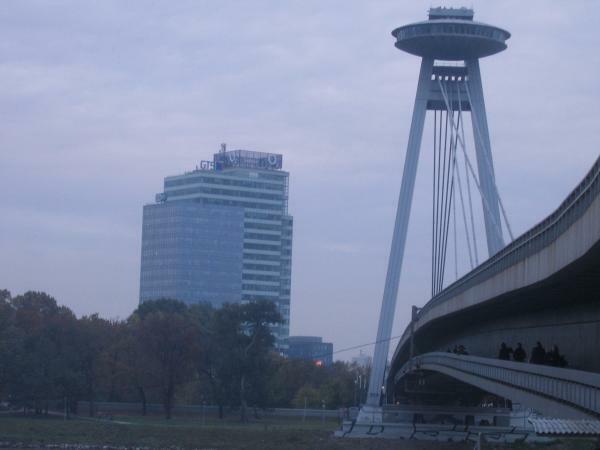 When we left Bratislava, the clocks were pushed ahead one hour, so it got dark at about 5pm now. 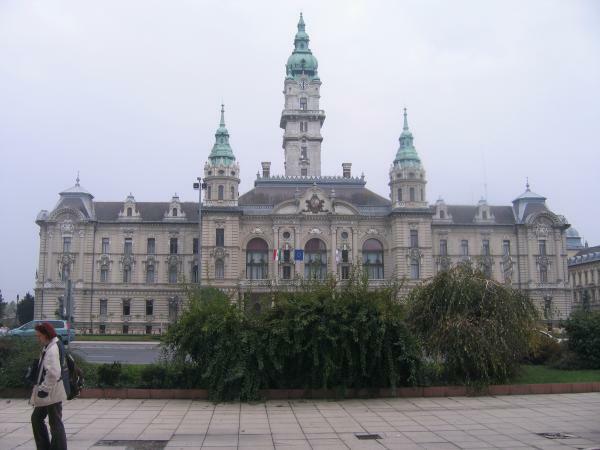 We made it to Gyor by noon, and we spent a couple hours exploring Gyor. It was neat city with a large pedestrian area in the city center. 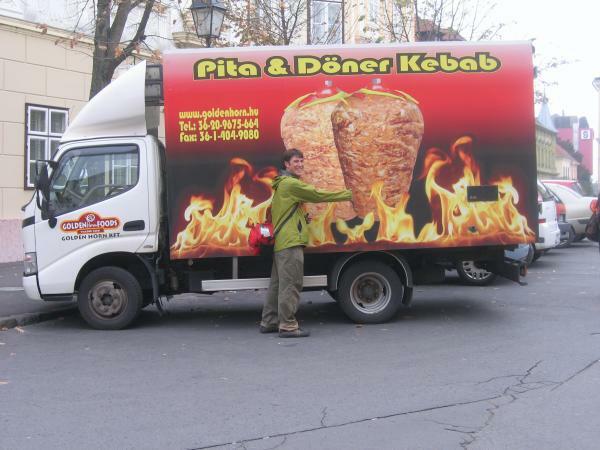 We also got our favorite food for lunch: kebab! Today, we woke up to a beautiful, sunny day! I actually was wearing my sunglasses all day long! As we were getting ready to leave the hostel, we met Ken Roberts from England, and he is doing a 4-year bike tour around the world. 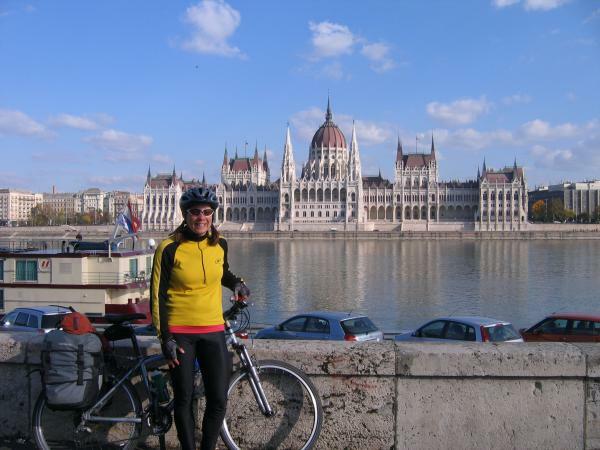 He biked along the length of the Danube bike tour like us, so it was fun to hear about his experiences. 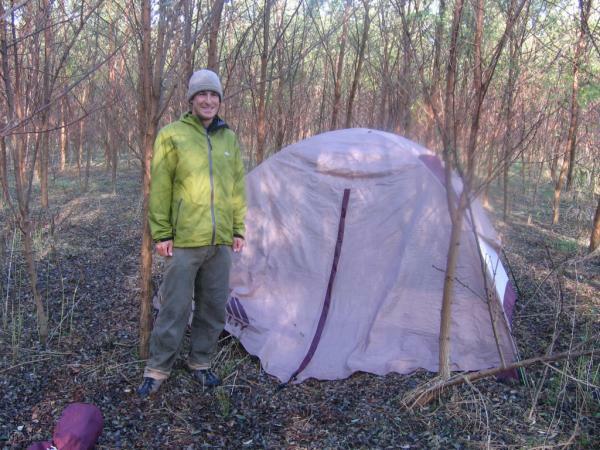 Check out Ken’s blog to follow his adventures as he bikes around the world. 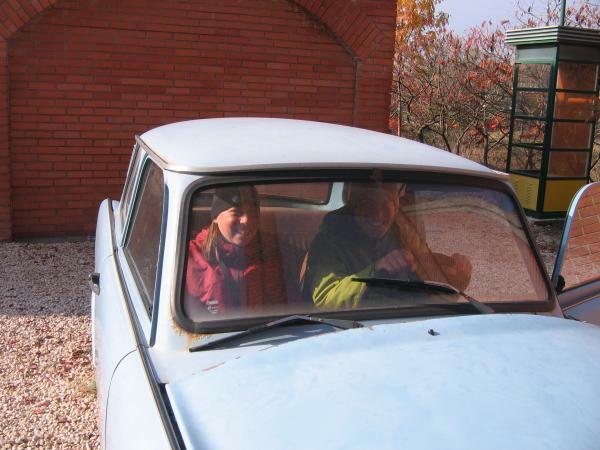 The ride out of Bratislava was really nice. We rode along a dedicated bike path the entire way, and the bike path was full of people out enjoying the beautiful day. 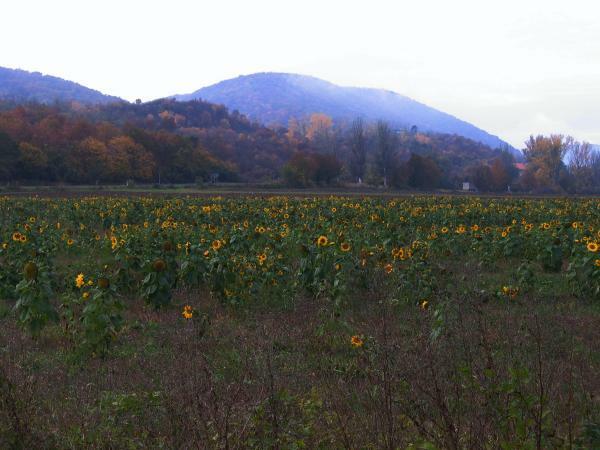 As we approached the border between Slovakia and Hungary, we turned off the main, busy road to a secondary road. 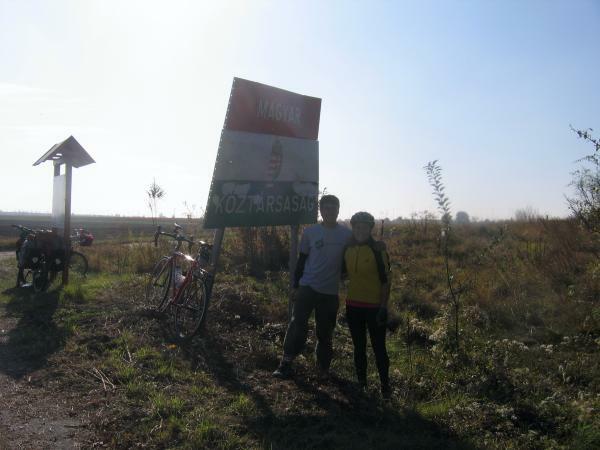 We were able to cross the border without a problem, and there was just a beat-up sign announcing we were entering Hungary. At the border, we met Steve from the University of Arizona who was also out for a bike ride. He was the first American we had met while biking! 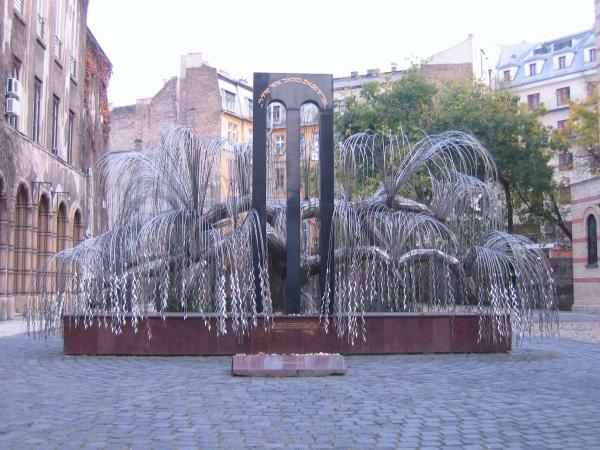 He was studying in Bratislava for a semester as an exchange program. 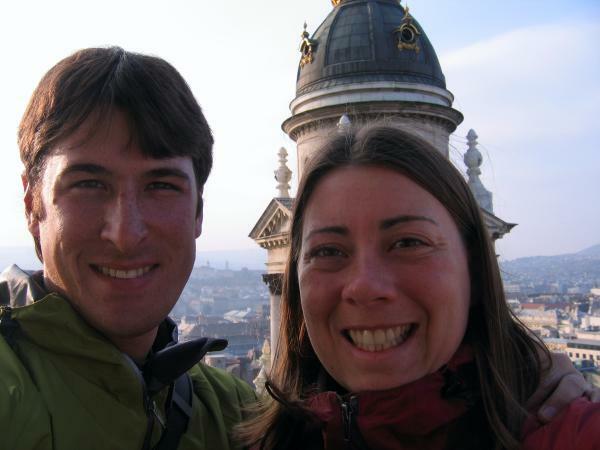 We talked to him about studying in Bratislava, and it was much different from our experience at Grinnell. He said masters students don’t show up for the first couple weeks of class. Some people only go to class a few times a semester, and they still manage to pass. 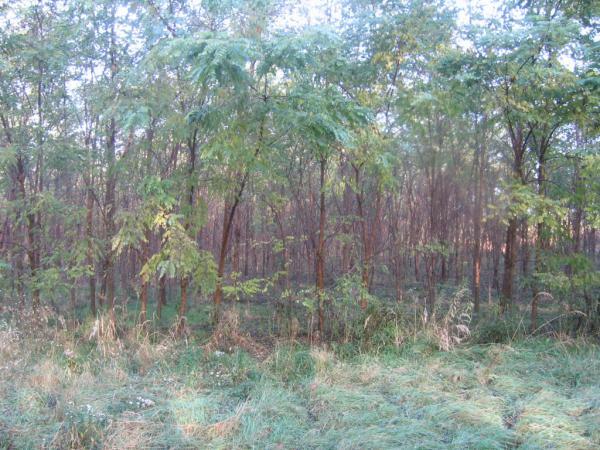 He had been at school for a couple months, and there had been a few lectures, no assignments, and no tests. He said it’s a great way to have lots of time to travel and see the country! We bypassed the main border checkpoint by turning off the main road, and Steve suggested we check out the abandoned border checkpoint. We decided to check it out, and it was crazy! It was strange that they didn’t board up the windows when the checkpoint was shutdown. 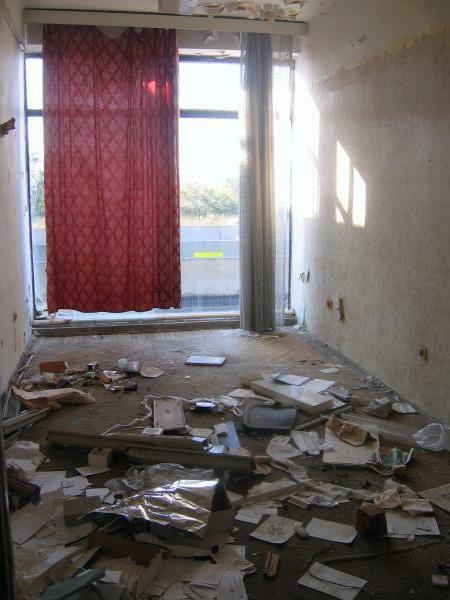 All the windows were broken, and people had gone in and completely trashed the place. 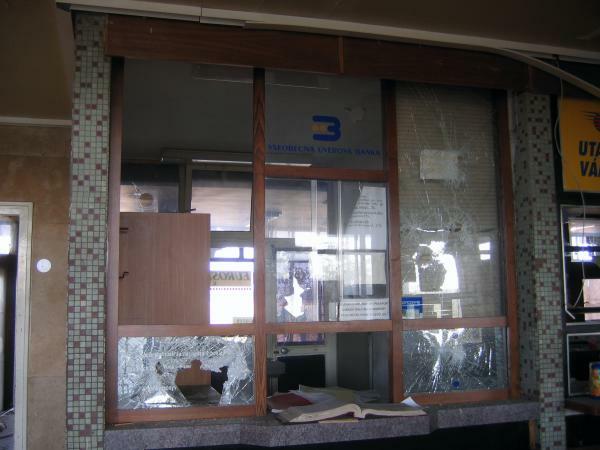 It was strange walking inside the building because some things had been left there since the closing of the checkpoint. They still had a calendar up in one of the offices, and there were old documents that were scattered all over the floor. 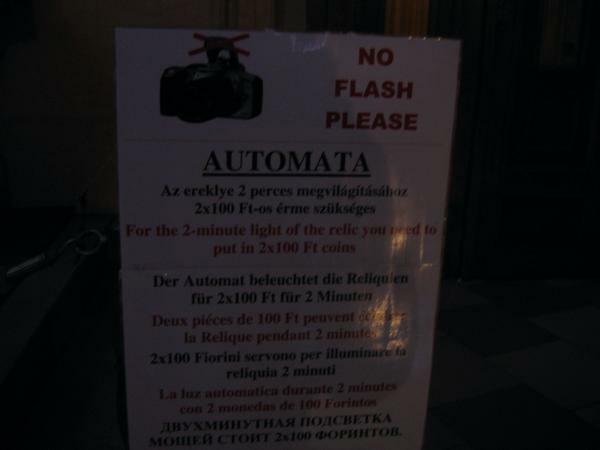 Hungary was a whole different experience for us. 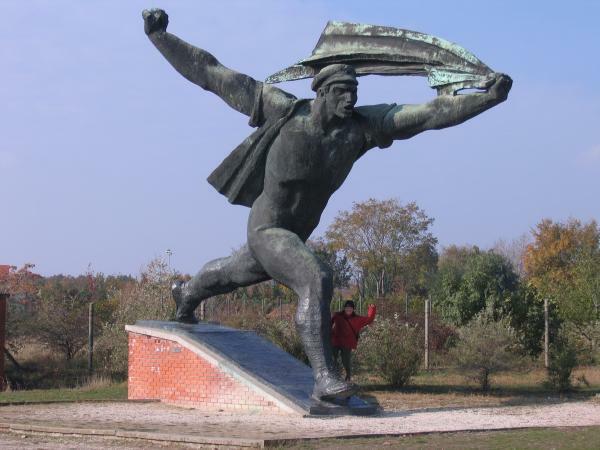 It was clear that Eastern Europe was not as economically advanced as Western Europe. 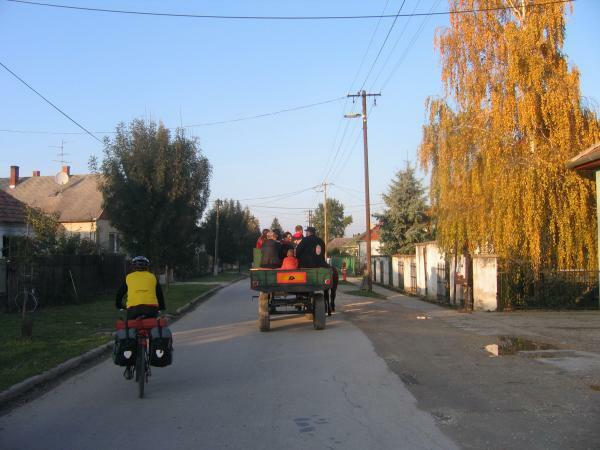 As we were riding, we passed several wagons that were being pulled by mules, and we only saw tractors when we were riding through the countryside in Western Europe. We got a late start with Jonathan fixing his Thermarest. 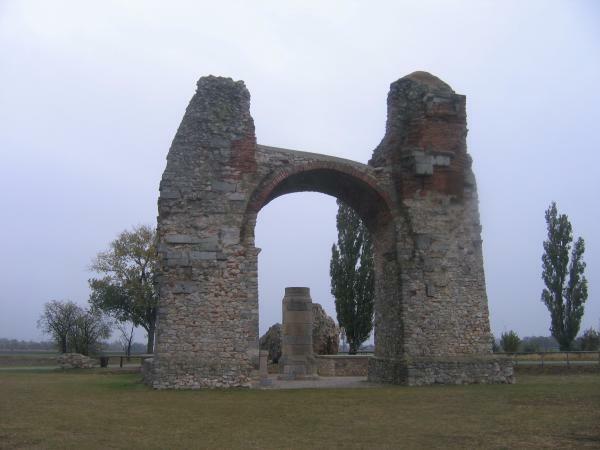 Petronell-Carnuntum had a large archaeological park with Roman Ruins, but we didn’t have time to check them out. Instead, we rode by the Roman Heidentor (Heathen’s Gate) on the way out of town. It was not actually a gate, but one of the four entrances to a victory monument for Caesar Constantine II around 354-361 AD. 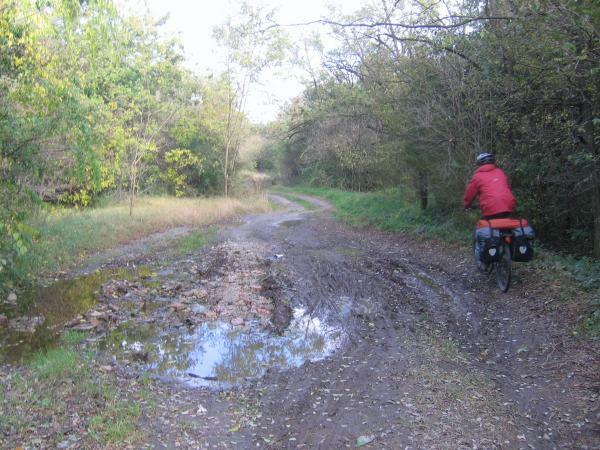 We had a wet, cold ride to Bratislava. 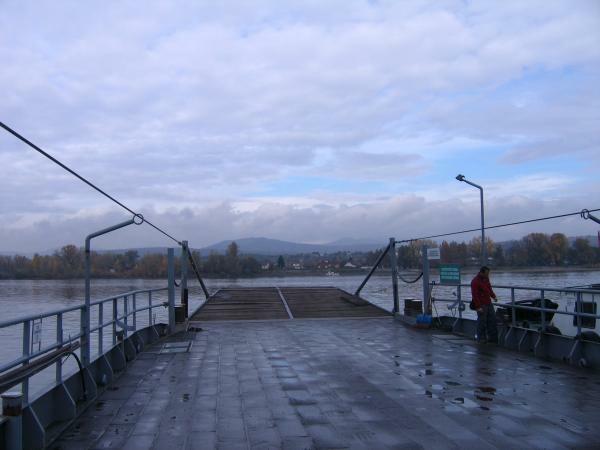 We experienced the most defined border crossing of the trip between Austria and Slovakia. 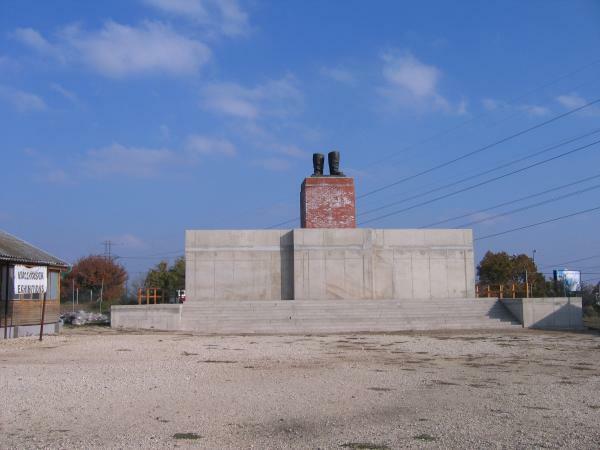 There was a large border checkpoint, but it was no longer in use since Slovakia joined the European Union. 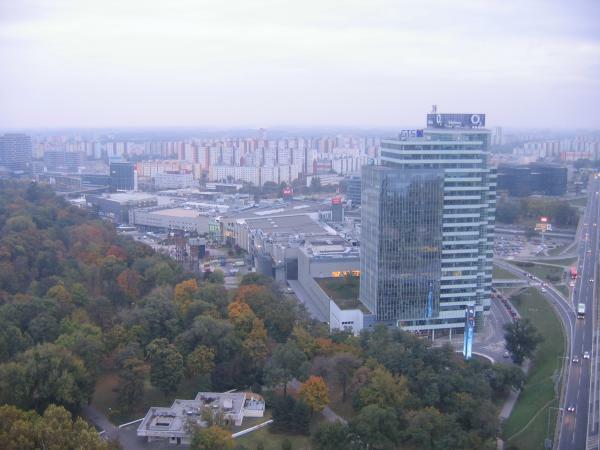 Originally, we were planning on continuing on to Hungary today, but it was such a miserable day that we decided to stop for the night in Bratislava. 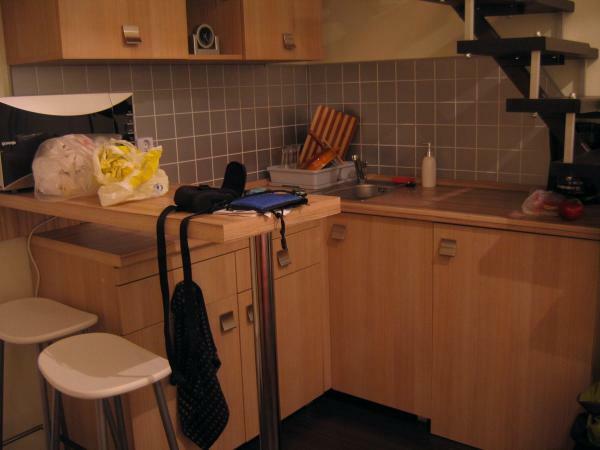 We found a great hostel near the city center. The hostel was run by Hostelling International, but it was much different from the Hosteling International places in Germany and Austria. 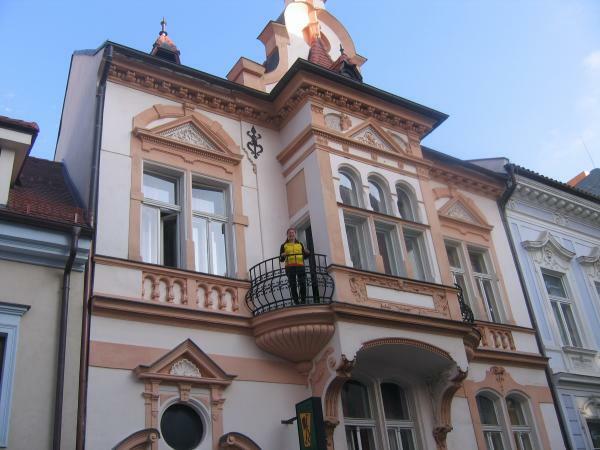 The hostel was located in an old building with lots of character, and it was conveniently located. We got a large double room with high ceilings, and it even had a balcony! Our awesome room with a balcony! We were really glad that we decided to stop in Bratislava. The old city was really neat, and it was closed off to cars! It was fun to walk around, and there were a lot of other tourists. I didn’t think that Bratislava was big tourist destination, but it may be a tourist stop because of its proximity to Vienna. We got roasted chestnuts from a stand in one of the squares. I had never had roasted chestnuts before, and they were really good. 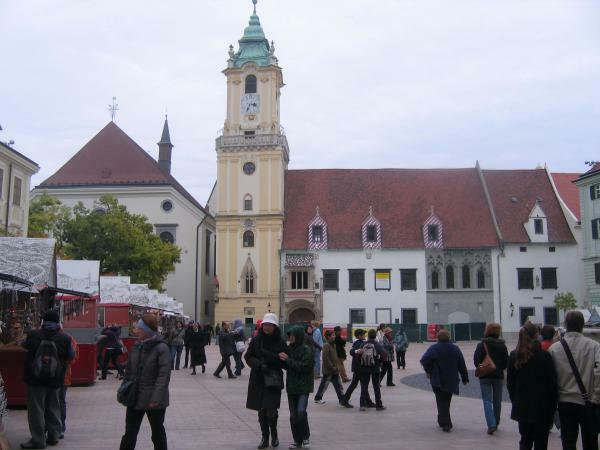 The old city of Bratislava was really neat, but the rest of the city was not so nice. 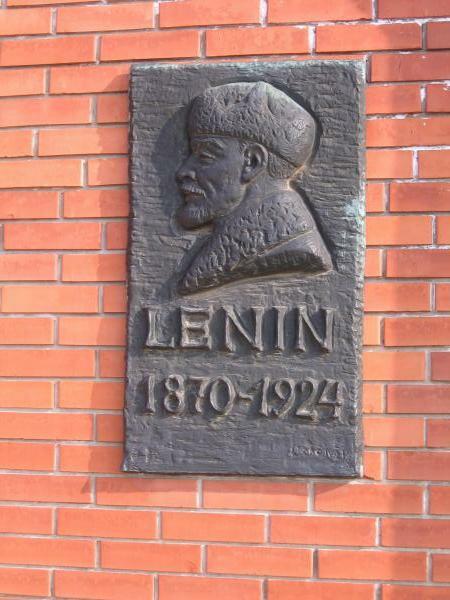 Once we left the city center, we encountered the dull, gray, ugly Soviet apartment buildings. 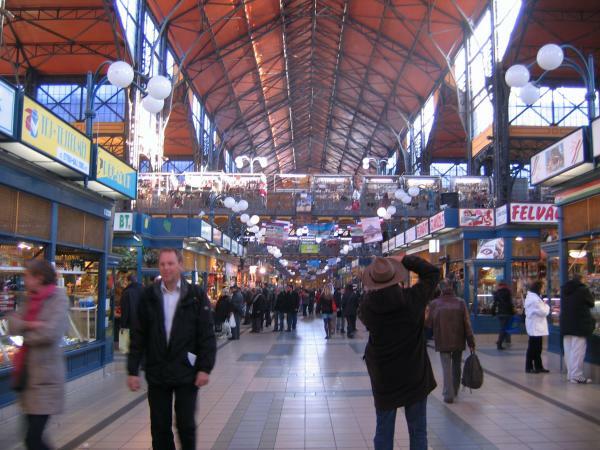 Slovakia was the first Eastern European country we visited, and it was a whole different experience from Western Europe. 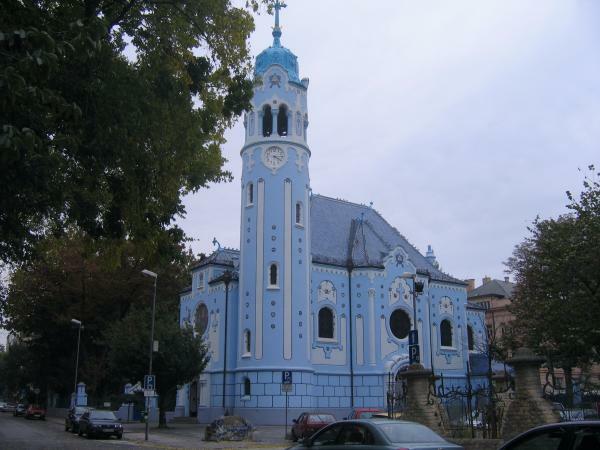 However, in the midst of all these dull, concrete apartment buildings, we found a beautiful, blue church. I think it was my favorite church we visited on the trip. 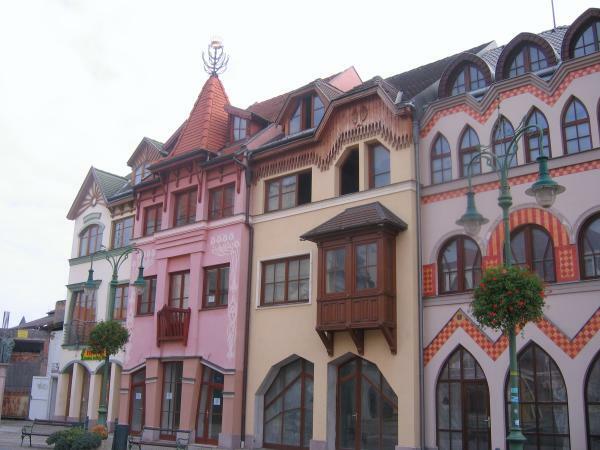 The design of the building was very unusual, and it reminded me of the buildings that Hundertwasser designed. We also went to the observation tower on the New Bridge. It is called the UFO because of its shape. It looked similar to the Space Needle in Seattle. We had a great view of the city from the tower. It was so windy at the top of the tower that I felt like I was going to be blown over! Petrzalka was the city across the river from Bratislava, and there were Soviet apartment buildings as far as you could see. 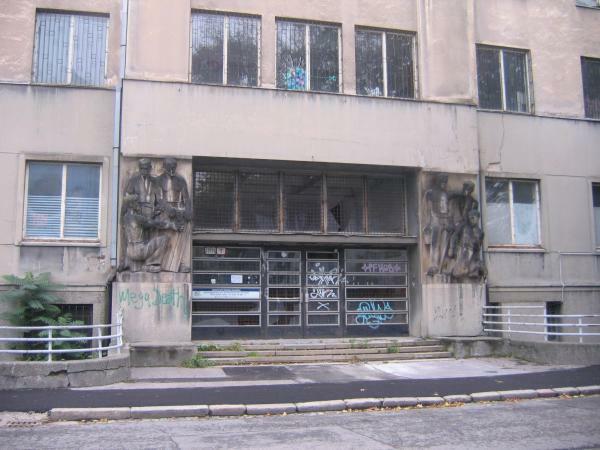 A guy we met told us that Petrzalka had one the highest concentrations of Soviet apartment buildings in Eastern Europe. I was worried about going to Slovakia when we didn’t speak any Slovakian. We were only going to be in Slovakia for a day, so it didn’t make sense to try to learn the language. Fortunately, it was not a problem at all! Everyone spoke English really well, and a lot of the signs were in English, too. Today was the first nice day we had in a long time. When we left Vienna, the sun was shining! 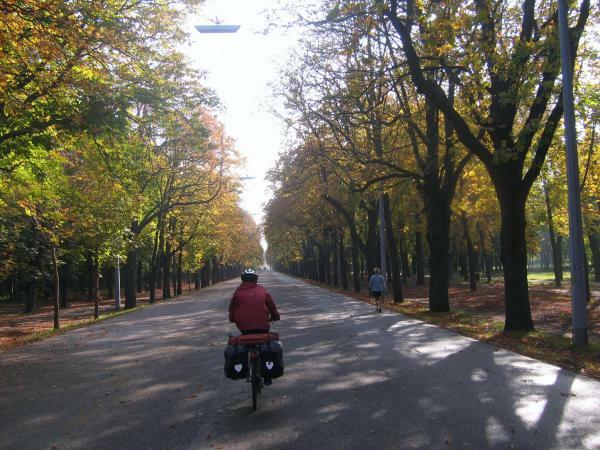 We rode out of Vienna through Prater Park. 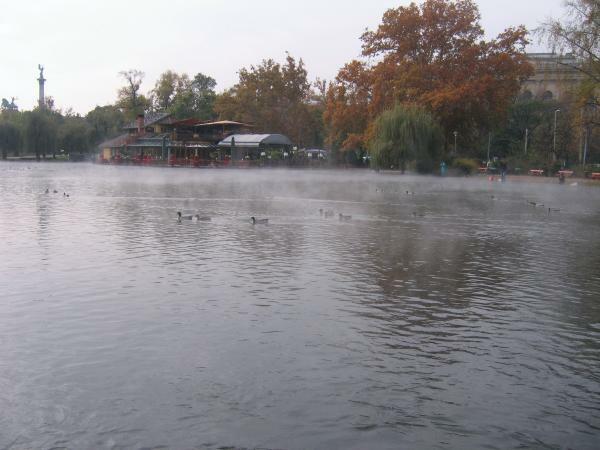 When we had walked around Prater Park last night, we only explored a small part of the enormous park. 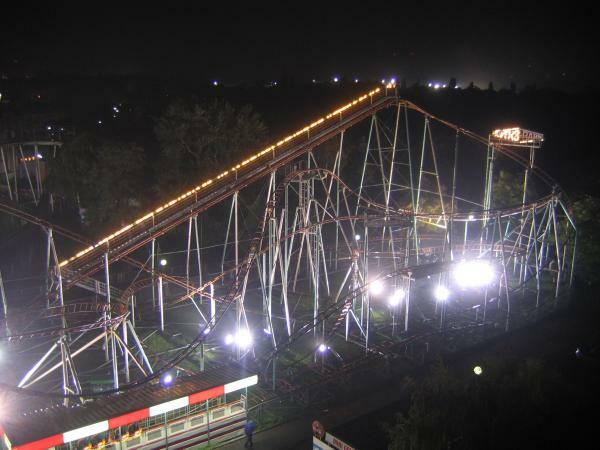 It took a long time to ride through the huge park! Just as we got out of Vienna, I got a flat tire. When I took the tire off, I found a big shard of metal that had pierced through the tire. There was a big gash in the inner tube that was really easy to spot. This was only our second flat tire of the trip caused by a puncture, so our Kevlar tires did a good job of preventing flat tires. 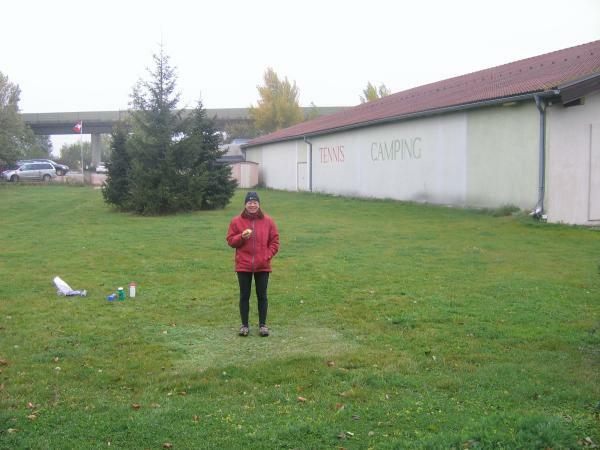 Tennis and Camping - a fun combination! We spent the morning at the Habsburg’s summer palace. 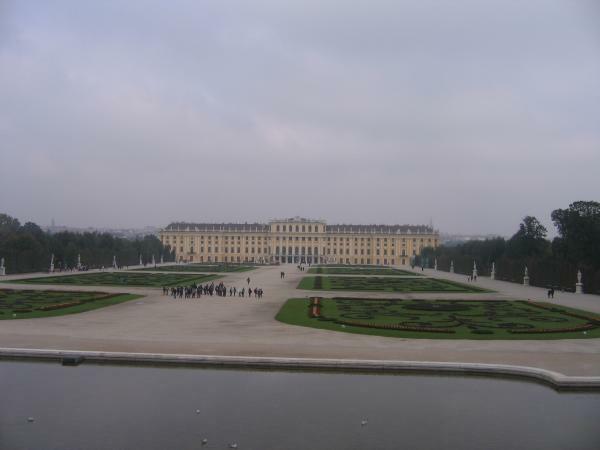 It started off as a “simple” hunting palace, but Maria Theresa had it completely redone in the rococo style to rival the palace in Versailles. They had the most complicated system for touring the palace. They had four different tours with different prices. The 20 room tour was 9.50 euros, but you could see an additional 10 rooms for only 12.50 euros and so on. Once we had selected the number of rooms we wanted to tour, we also could only enter the palace at the specific time stamped on the ticket. 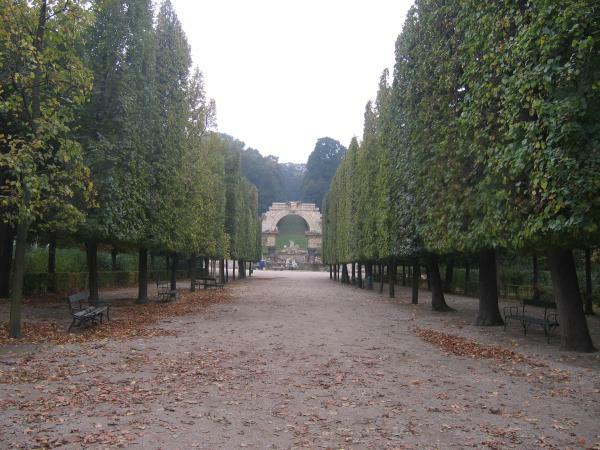 Fortunately, we were there during the off season, so we only had to wait a few minutes before we could tour the palace. We did the tour of the imperial apartments, and they were incredibly fancy. 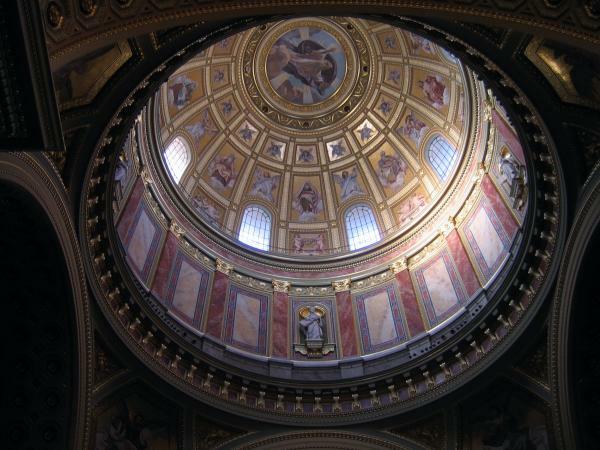 The Habsburgs spent a lot of money on the palace. The walls and ceilings were covered in gold leaf. Each room had a ornately decorated ceramic stove for heating. The stoves were refueled by servants from behind, so all the walls had passageways behind them for servants to keep the rooms heated. It was interesting to see Franz Joseph’s rooms. He prided himself on his simple lifestyle and his strict discipline towards serving the empire. 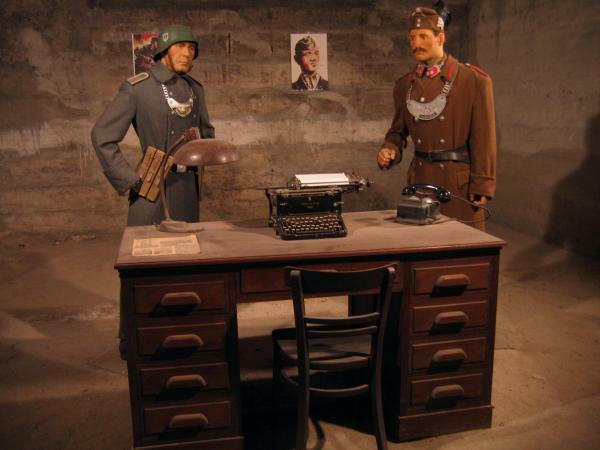 His rooms were plainly decorated with only a simple bed and desk. However, it seemed contradictory that he was still living in an enormous, fancy palace. The summer palace also was surrounded by a large set of gardens, so we walked around in the gardens for a while. While we were walking around, the sky started to clear up, and the sun actually came out! 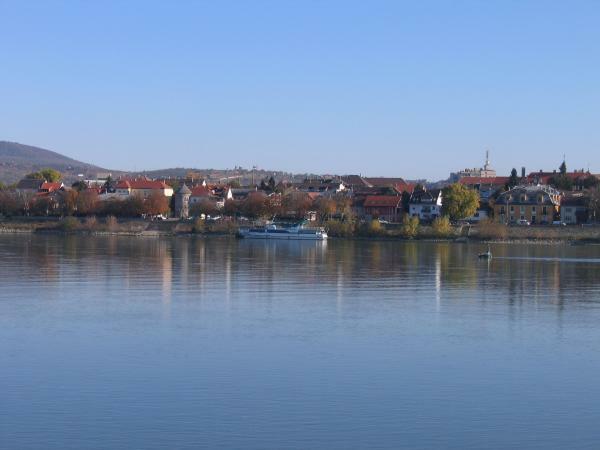 It was sunny for the rest of the day, and the temperature reached double digits for the first time in days: 12 degrees Celsius. It was the nicest day in a long time. 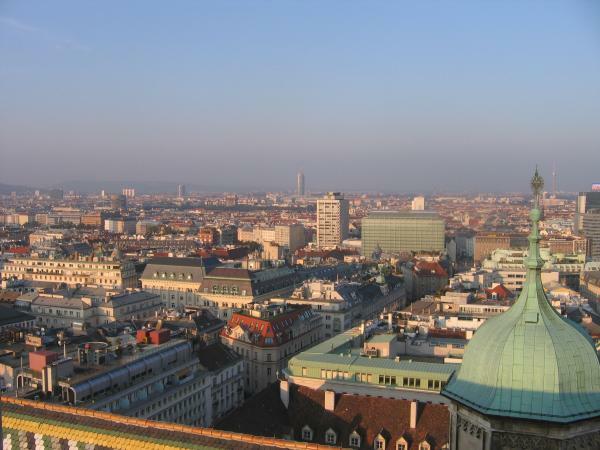 We climbed the tower of the St. Stephans Cathedral. The top of the tower was like the Belfort tower in Bruge. We were not allowed to walk around the outside of the tower, and we could only look through the small windows on each side of the tower. Nevertheless, the view from the tower was neat. Vienna was a big place! The city went on as far as we could see from the tower. After climbing the tower, we got ice cream for the first time in days. We celebrated the warmer weather with three scoops of ice cream. 🙂 We wandered around the city for the rest of the day. We stopped by the large fountain by the Belevedere Palace, and while we were there, we saw two balloons similar to our trash bag balloons released from the statue by the fountain. Their design was similar to ours, but they used tissue paper instead of a trash bag. They seemed to have a different type of fuel, too. One of the balloons went really far until we could no longer see it. The other balloon didn’t do as well, and it got stuck in the tree and burned the tree a little bit. We were surprised that these people released these balloons in the middle of big city considering they are a fire hazard if they get caught in something. When we did our trash bag balloon, we kept control of it with a kite string. Yesterday, the weather had been nice, but today it was rainy and cold. It was a good day to spend inside of museums. 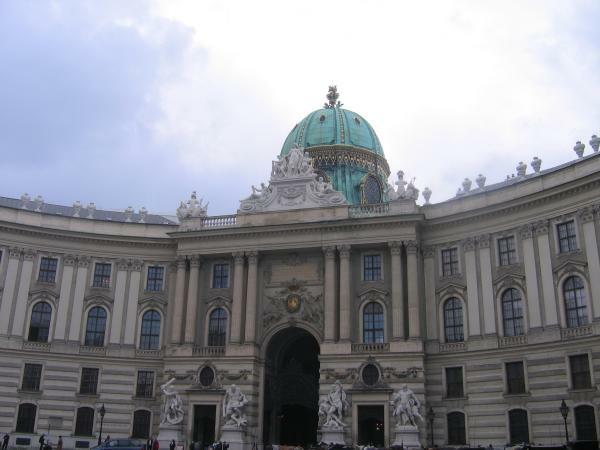 We went to the Hofburg palace to tour the imperial apartments. 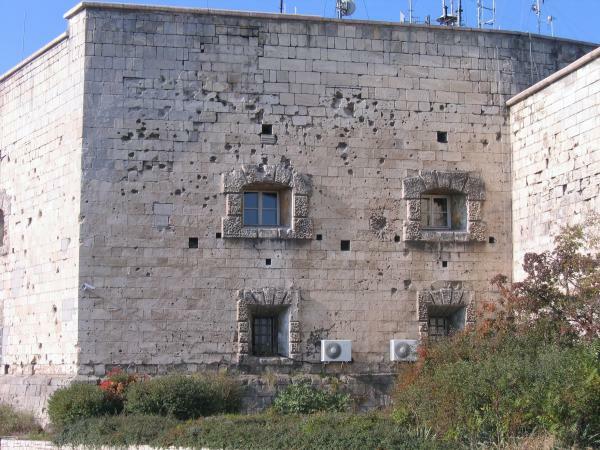 First, we had to figure out which of the many doors went to the imperial apartments in the enormous palace complex. We finally found the entrance to the museum. 🙂 The museum began with the Habsburg silver collection, which consisted of room after room of tableware. The Habsburgs had an obscene amount of tableware. When they traveled, they brought their tableware with them since they wouldn’t have sufficient tableware where they were going. They had big carrying cases for the tableware. The most interesting part of the silver collection was the exhibition of the foot washing ceremony. Before Lent, the emperor would wash the feet of 12 poor old men, and the empress would wash the feet of 12 poor old women. The symbolism of the ceremony was that Jesus washed the feet of his disciples. Each person was also given 30 silver pieces, the same amount Judas received for betraying Jesus. The next section of the museum was dedicated to Empress Elizabeth, or “Sissi”. It detailed her life from her carefree days growing up as a Duchess in Bavaria to her life as empress of Austria and her assassination. Apparently, Sissi was very shy and timid, and she was not well-suited for the duties of a being a public figure. She resented her lack of freedom, and she disliked all the attention she received. She mostly left the politics to Emperor Franz Joseph, but she did intervene when Hungary was struggling for independence from the empire. She was influential in convincing Franz Joseph to sign the agreement creating the dual monarch of Austria-Hungary. 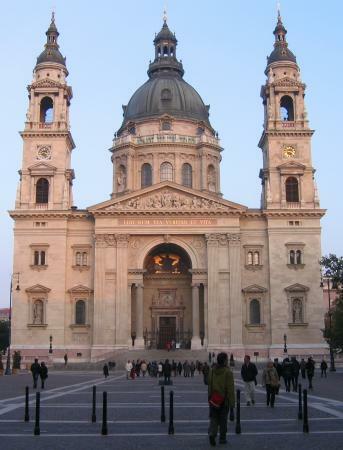 This was a substantial change in Franz Joseph’s policy towards Hungary. 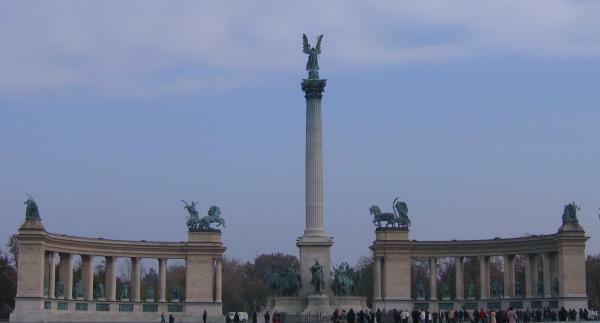 The Hungarian rebellion was brutally repressed, and Franz Joseph had paintings of the defeat of the Hungarian armies in his meeting room in the summer palace. Once Sissi’s only son committed suicide, she started wearing only black and became completely withdrawn from court life. She became more melancholy and depressed and talked about the end of her life. She was assassinated by Italian anarchist while she was traveling. She was only stabbed once in the heart by a small file. After being stabbed, she actually boarded the boat that she had been waiting for before she was stabbed. The boat left shore with Sissi on it, and it only returned to shore later when they realized that she had been stabbed. She died shortly afterwards. 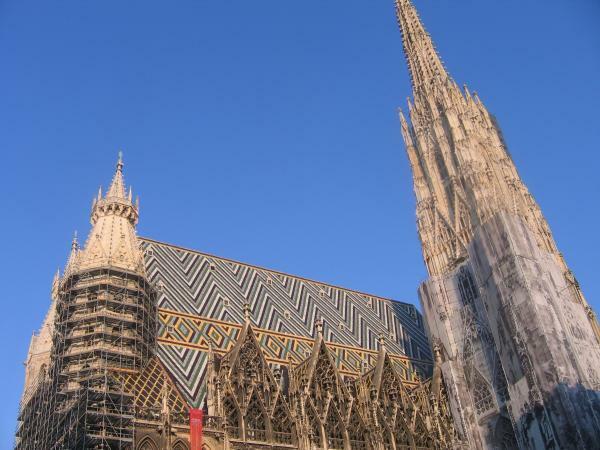 Vienna was the home of an amazing artist/architect named Hundertwasser. We went by the Hundertwasser Haus built by him, and it was one of the coolest buildings I have seen. Hundertwasser disliked straight lines, and he said, “Straight lines are godless.” His buildings were full of curvy lines. Hundertwasser was very opinionated, and he believed in getting back to nature in the way we live. 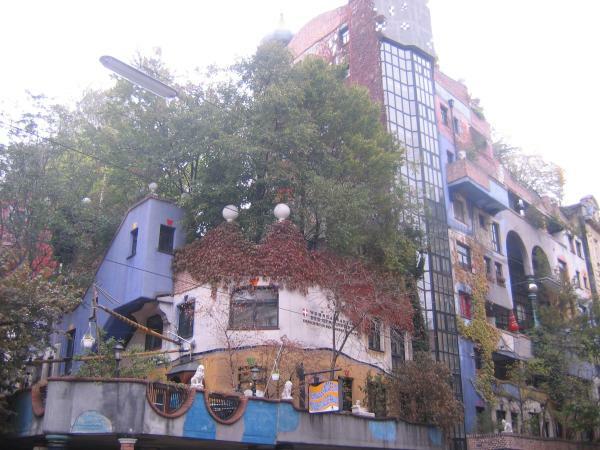 The Hundertwasser Haus had trees growing from the windowsills. 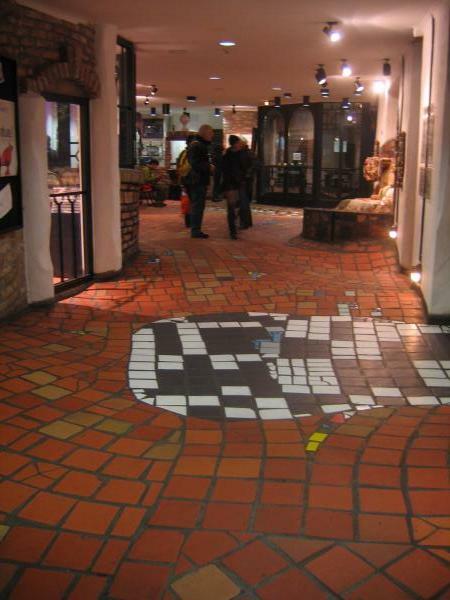 We also went to the Hundertwasser museum, and the curvy floors were the coolest part about the museum. 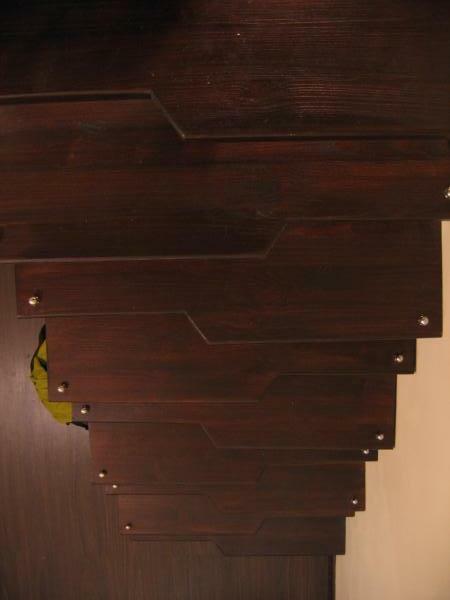 Hundertwasser said that straight floors are for engineers, not people, and it wasn’t natural for people to walk on straight floors since nothing like that occurs in nature. He had an awesome futuristic architectural design for a city where all the houses were halfway underground with green roofs you could walk on. 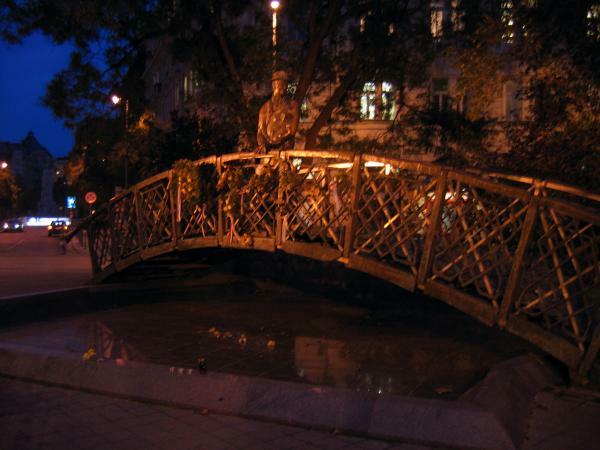 There was also a stream running through the city that you could paddle a boat down. It seemed like a wonderful place to live. 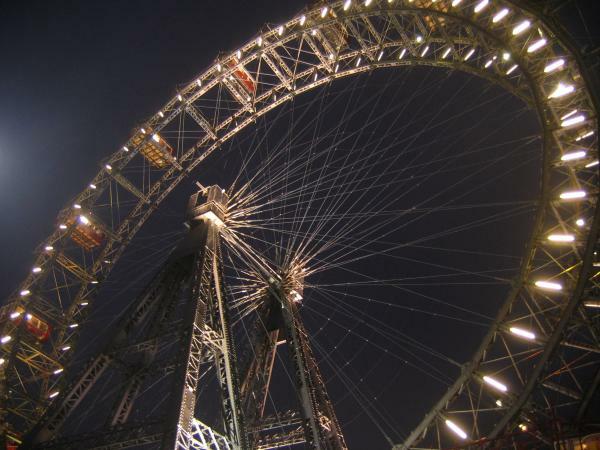 No visit to Vienna was complete without a ride on the Giant Ferris Wheel at Prater Park. We thought it would be neat to go on the ferris wheel at night to see the lights of the city, but Vienna does not have a lot of city lights that you can see from the ferris wheel. 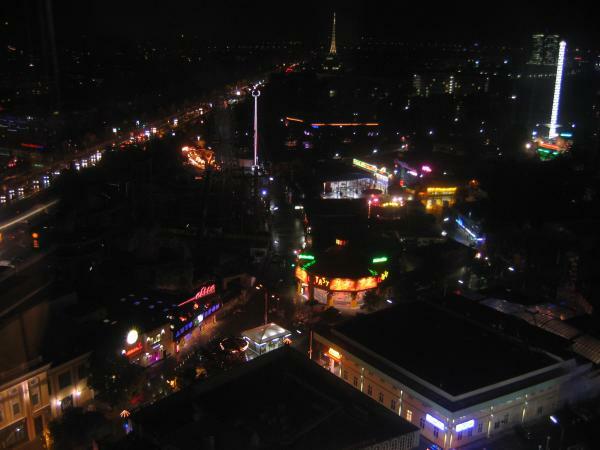 However, it was neat to see the lights of the Prater Park amusement park rides. Prater Park used to be the Emperor’s hunting grounds, but the Emperor turned over the hunting grounds to the citizens of the city. 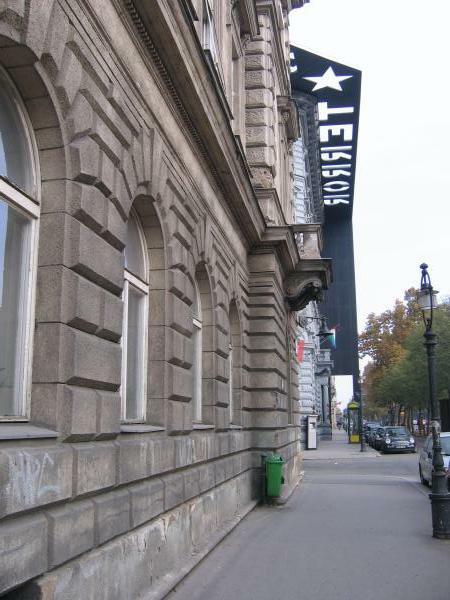 It has been a popular place for people of Vienna to relax and have fun ever since then. However, everything at the Prater Park was overpriced. We were thirsty and got a completely overpriced Coke at the gift shop. They had Ben and Jerry’s ice cream, and it was 7 euro for a pint, which is about $10.50!